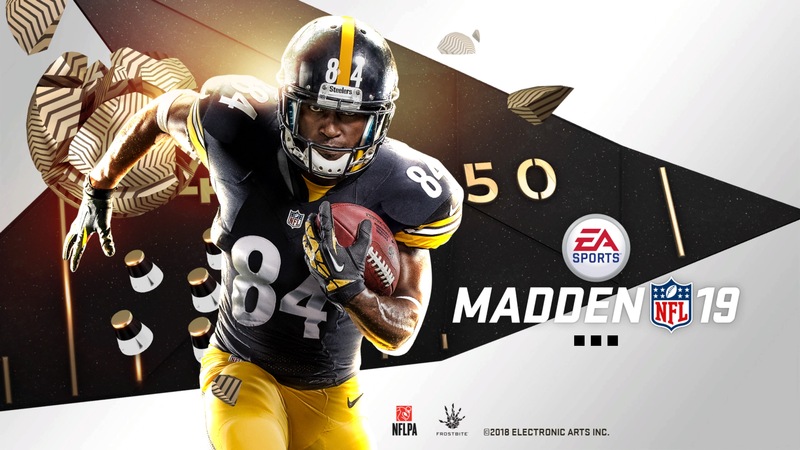 EA Sports has released its annual edition of Madden NFL 19. 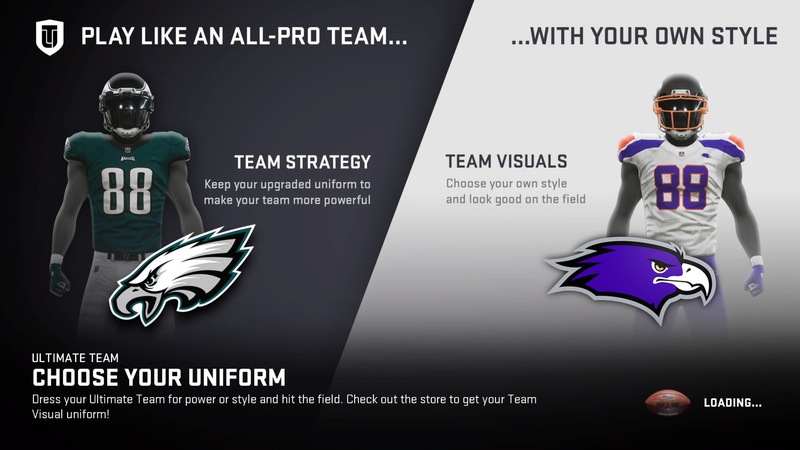 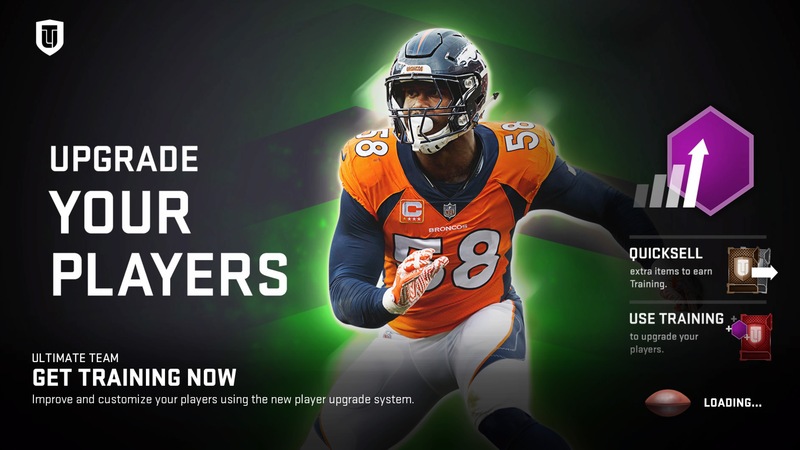 Is there enough of a difference to warrant a new purchase, or should you just continue to enjoy Madden NFL 18? 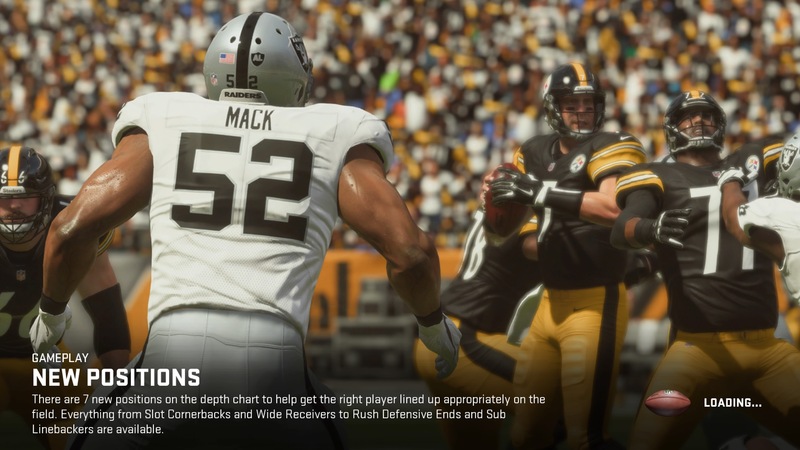 Last season’s release of Madden NFL 18 introduced, for the first time, a real story mode for the long lasting franchise. 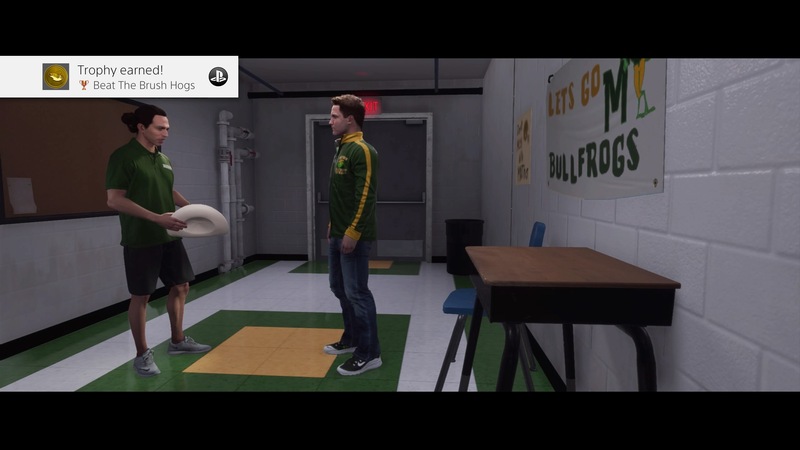 It followed two friends through their high school football exploits as quarterback Devin Wade and wide receiver Colt Cruise led their team to a storied Texas High School State Championship. 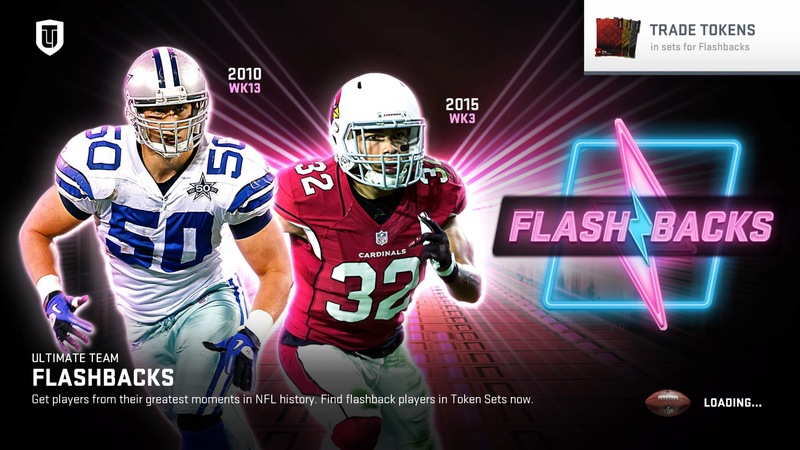 The story then followed them as they tried to make it in the NFL draft, both falling short, and both being asked to star in a reality show called Longshot, with a chance to make it in the NFL. 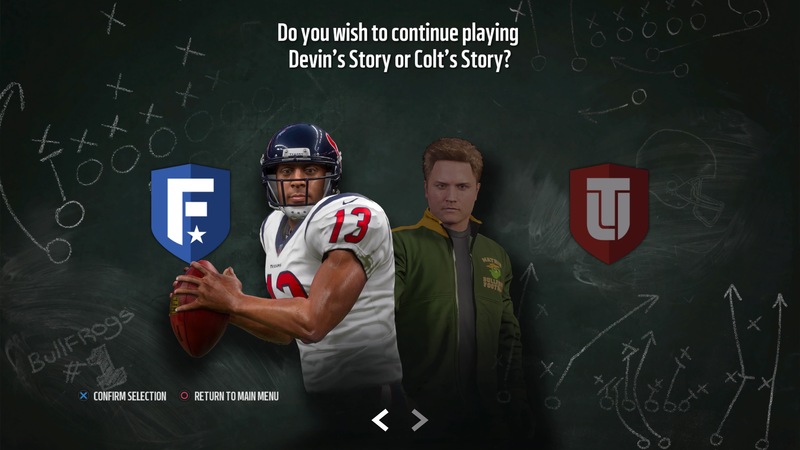 It was a memorable story, but in the end it left Colt outside of the NFL and Devin struggling to survive and fit in somewhere with an NFL team. 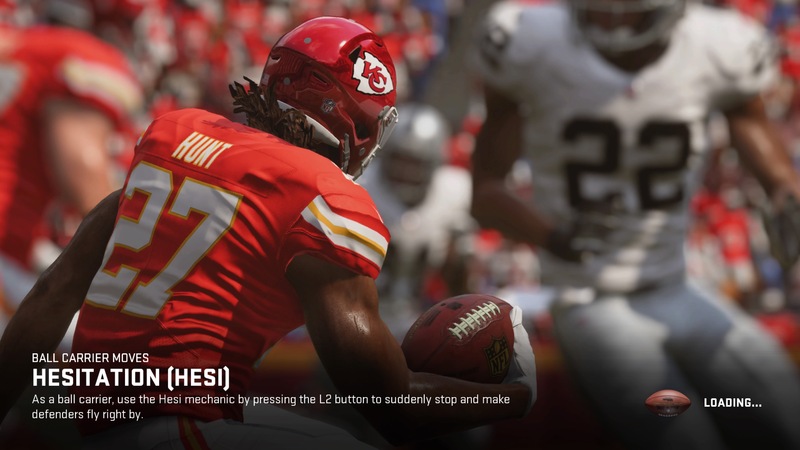 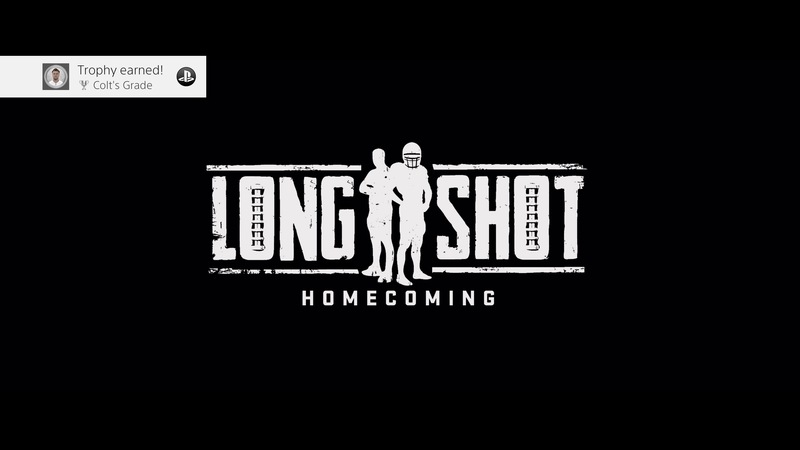 Fast forward to Madden NFL 19 and we find that the struggles for both continue, with the next installment of their story: Longshot: Homecoming. 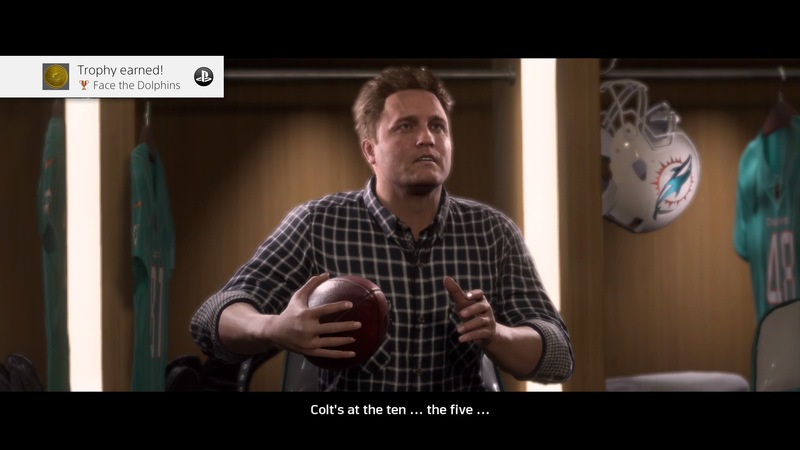 Wade is trying his best to make it on the Dallas Cowboys, even if it is only as a back-up QB, while Colt is waiting patiently by the phone for his agent’s call for a tryout somewhere. 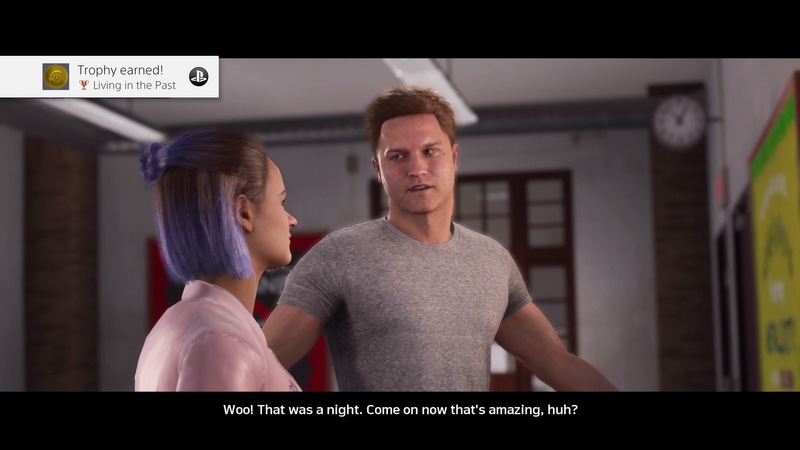 The game bounces between the two story-lines and does a great job of keeping them tied together through interactions between the two good friends. 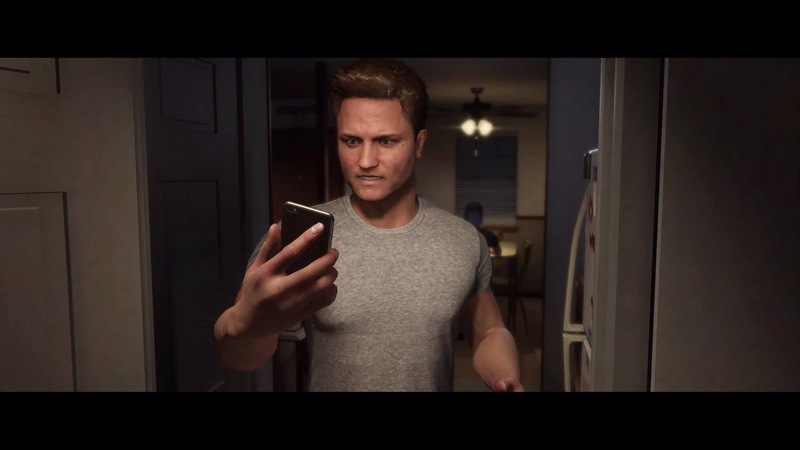 The story plays out as if it was written for a movie, with intriguing characters and even some pretty big names lending their voices, likenesses, and acting skills along the way.The story is touching at times, and the voice acting is done very well. 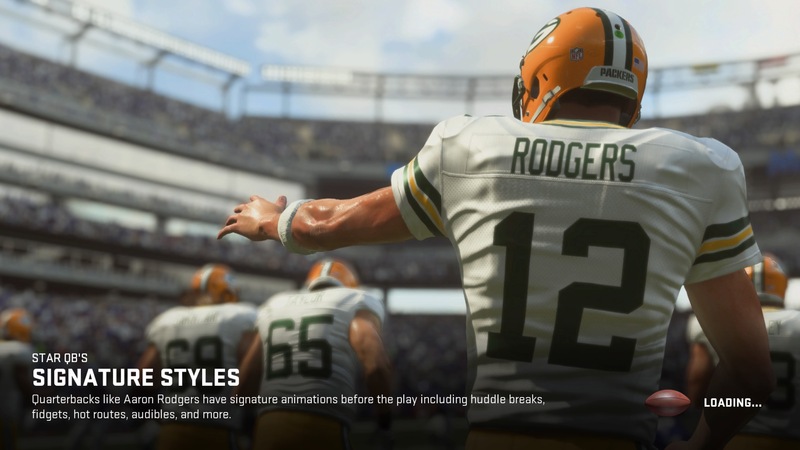 The story mode alone is enough of a reason to get your copy of Madden NFL 19, but honestly it shouldn’t be the only reason. 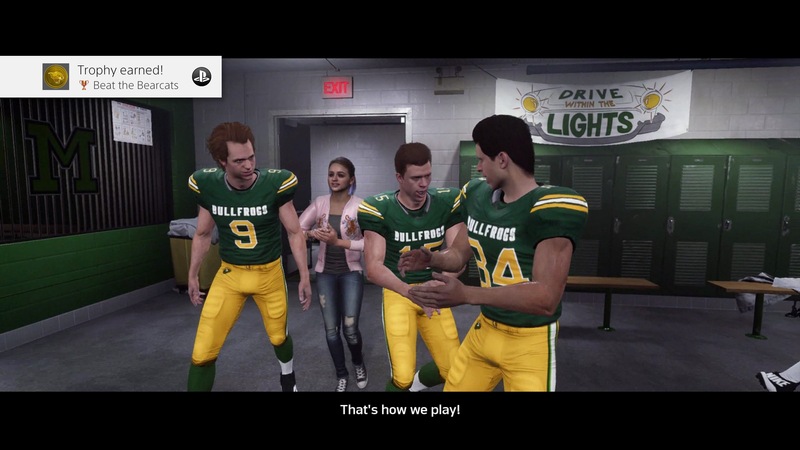 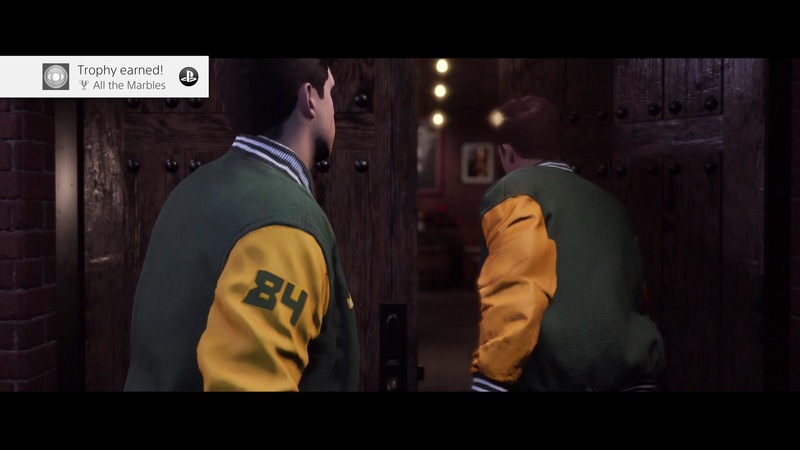 A sports game is only as good as its animations and comparisons to real life in both realism and the surrounding environments, and EA made the game shine. 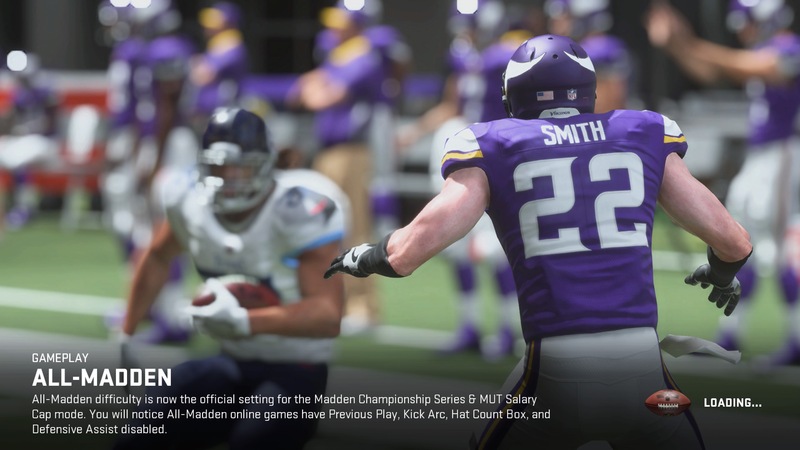 Using Frostbite’s latest gaming engine, EA has employed real motion technology to make Madden NFL 19 look and act as close to real life as possible. 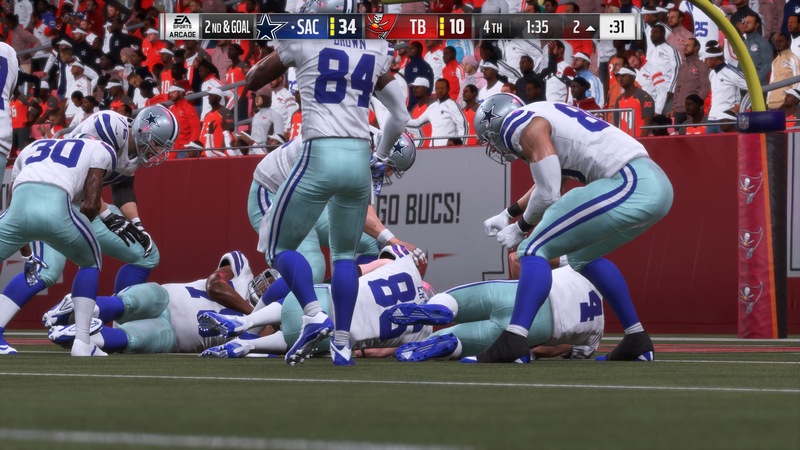 The smoothness of a character’s motion mimics the natural motions of a real life person to the point where Dak Prescott, in the game, looks and acts just like Dak Prescott on the field running the Dallas Cowboys offense. 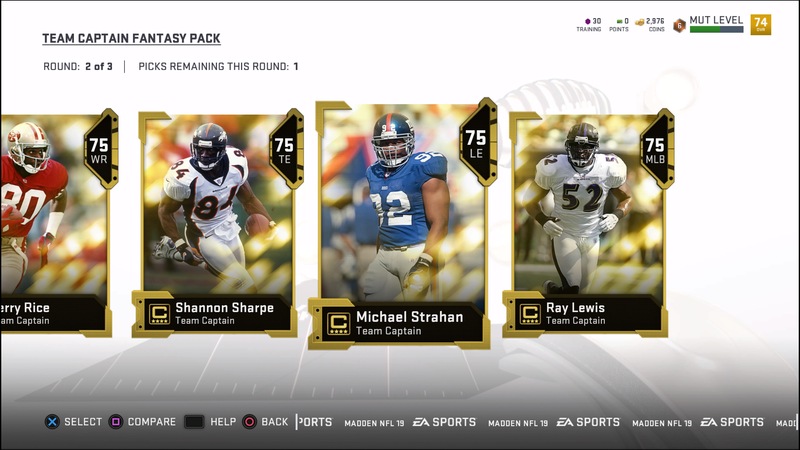 It’s an uncanny result that gets better every year. 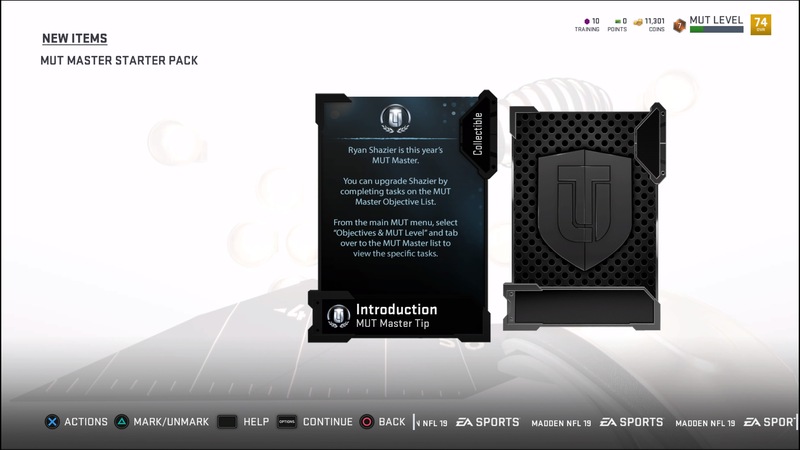 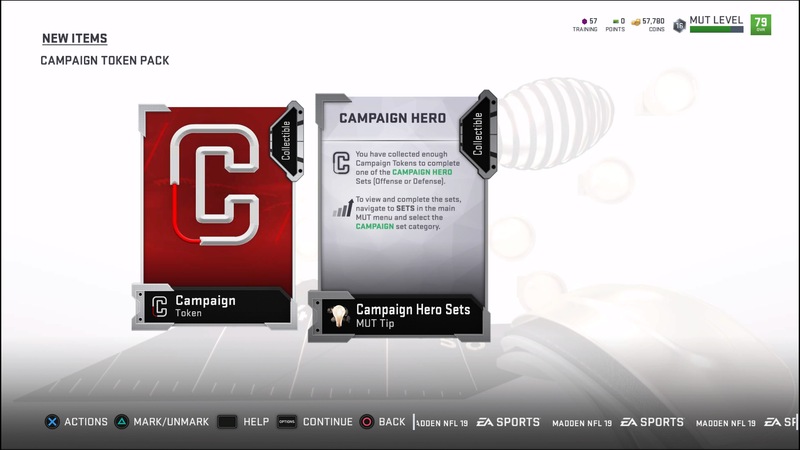 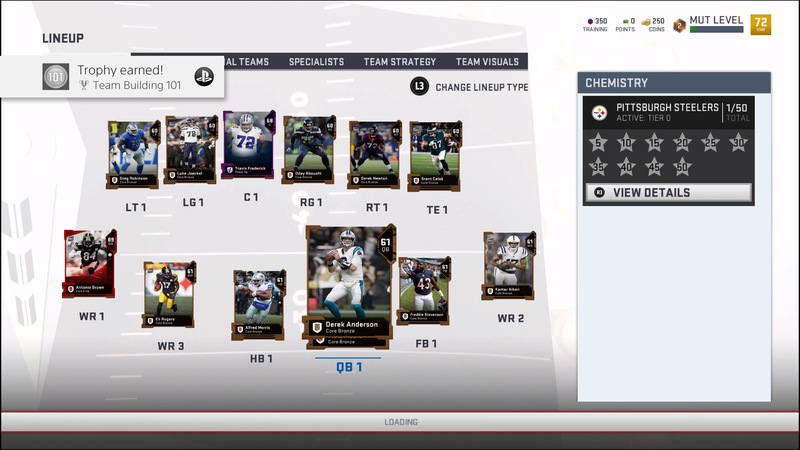 For those that are into the trading card system based Ultimate Team part of the game, it has been revamped this season to add upgradeable players. 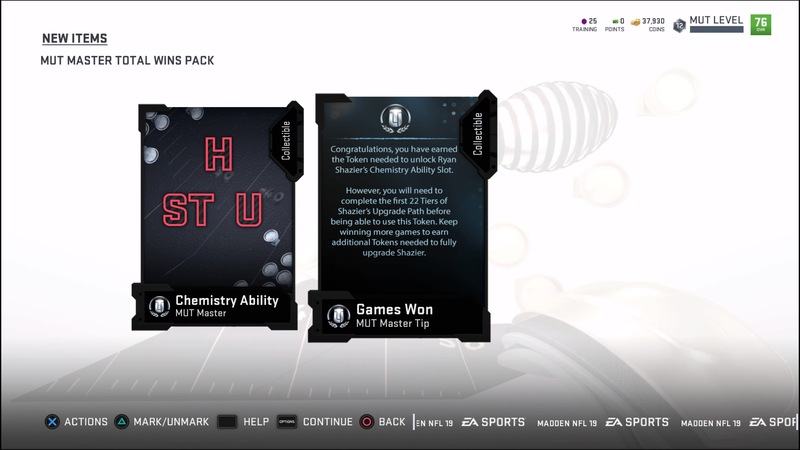 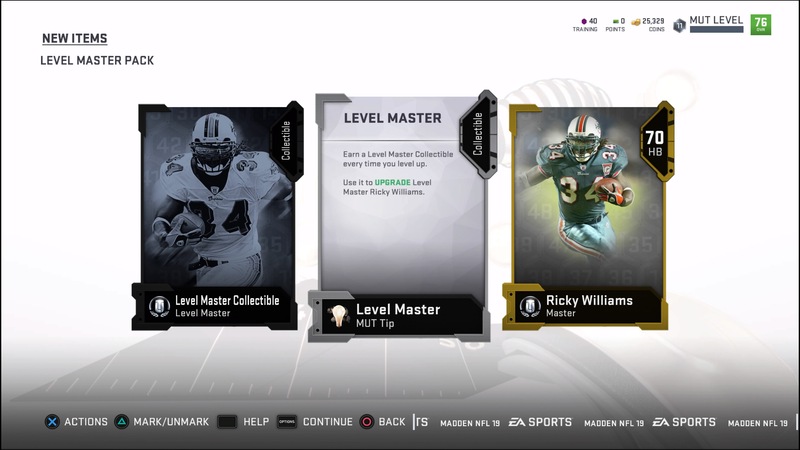 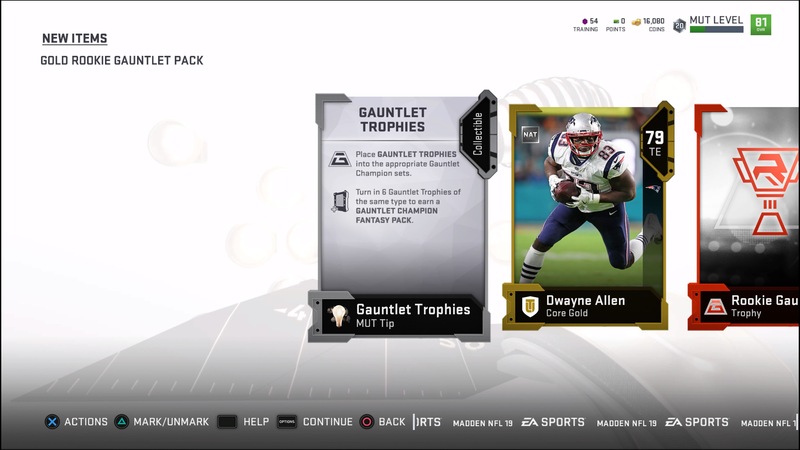 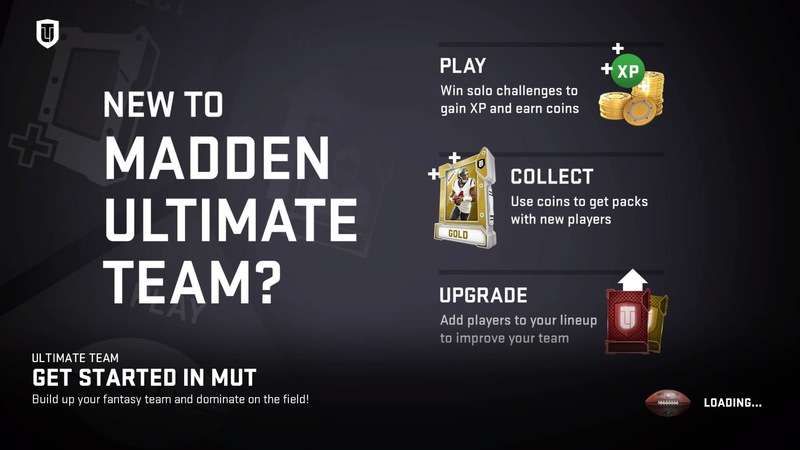 For those that are new to this mode, Ultimate Team has you collecting player’s trading cards and using those cards to build your team. 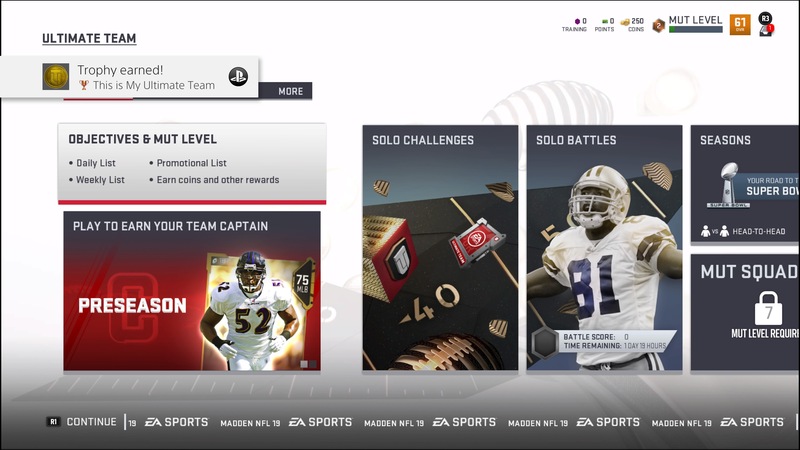 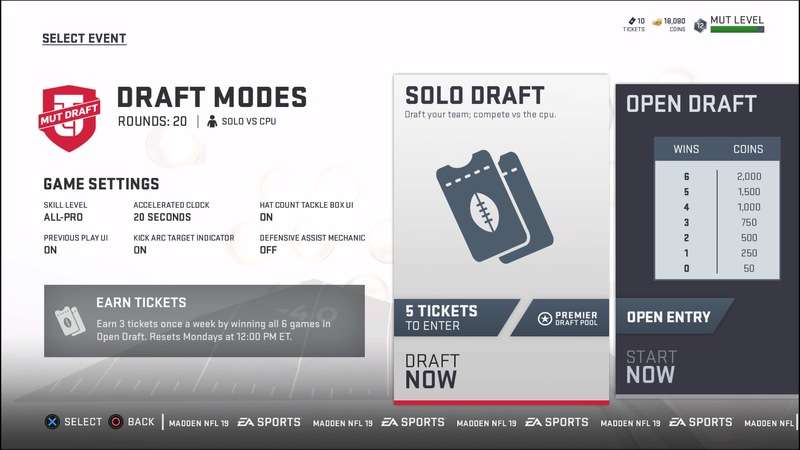 Once built, you can challenge other players online or work towards getting a better team by working through the many Ultimate Team Challenges, buying packs through the in-game store, hitting the auctions page, or even trading with other players. 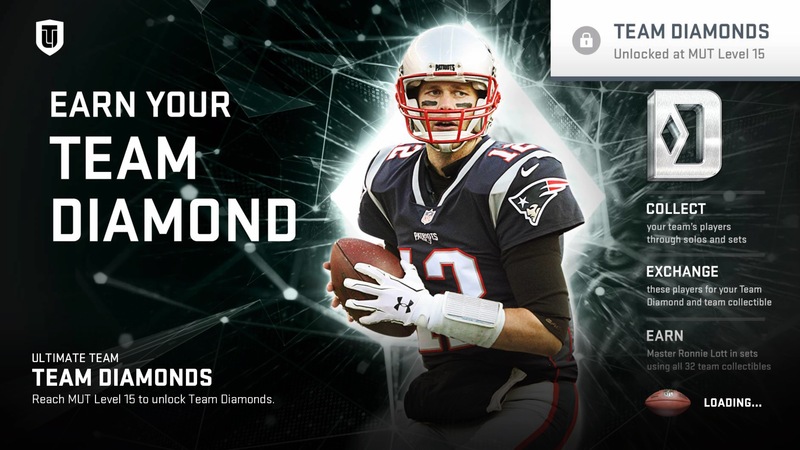 Spending real world money is a possibility, but not required to build a pretty great team. 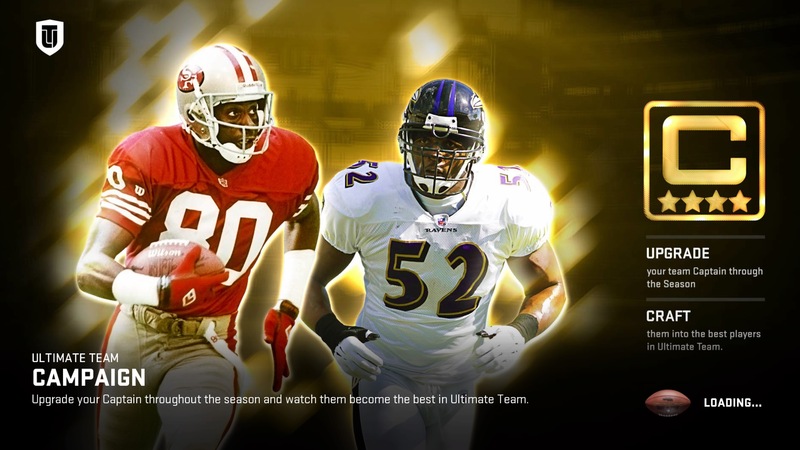 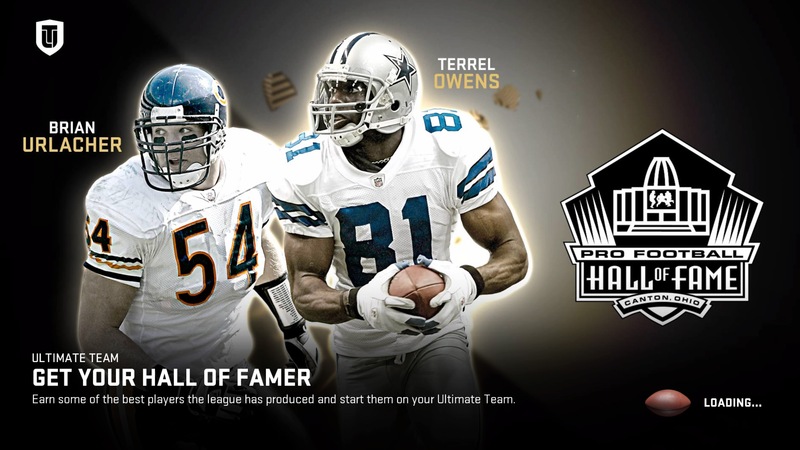 The Ultimate Team challenges are the key to unlocking an upgradeable Hall of Fame Captain, as well as other high quality players, and for earning player packs and coins. 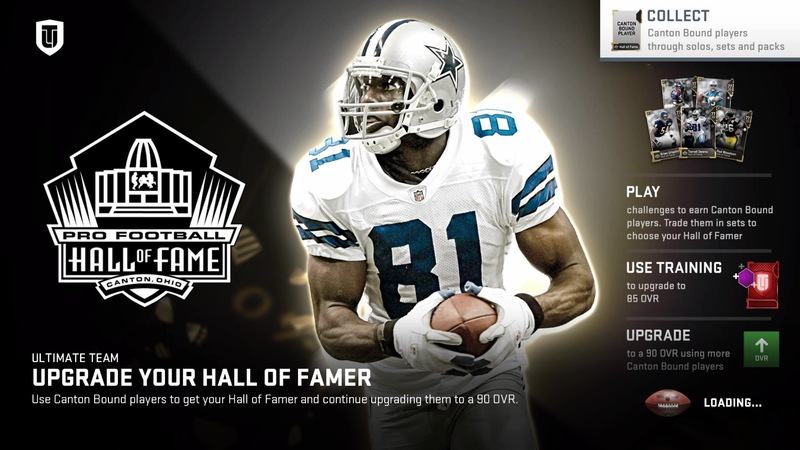 It was odd to see arguably the greatest wide receiver ever as our team captain and only be rated a 75WR. 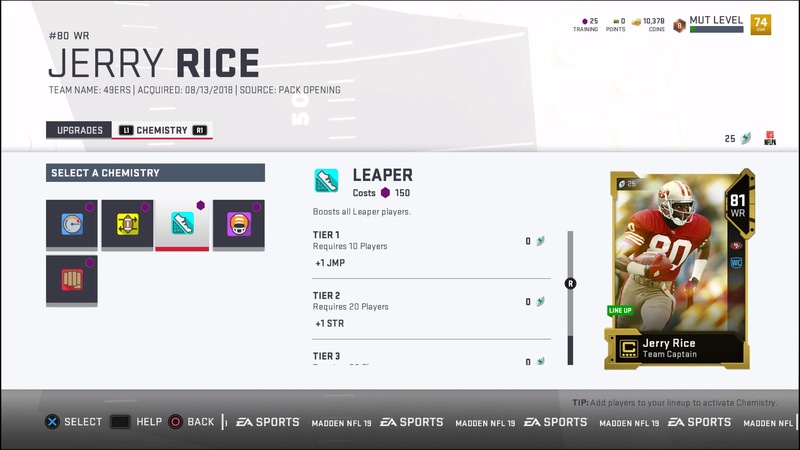 Even at that level Jerry Rice has the hands and footwork that made him a legend, but as we spent our training points on him, he became better and better. 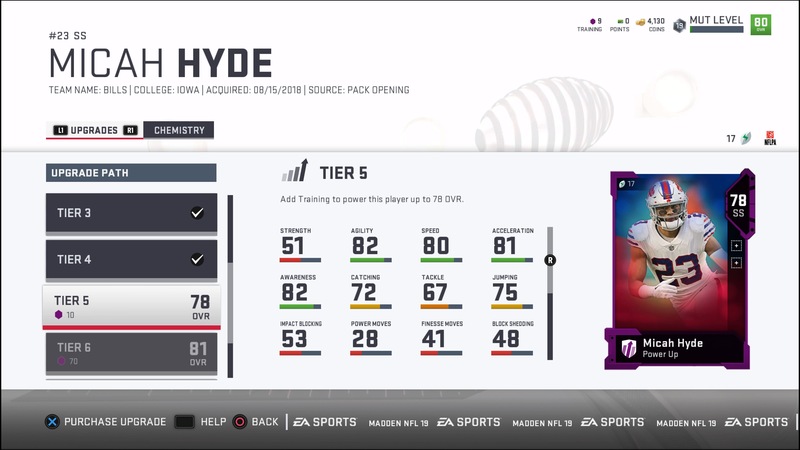 We havn’t reached his pinnacle max yet, but he’s already our best receiver even though he’s currently rated lower than Antonio Brown on our team. 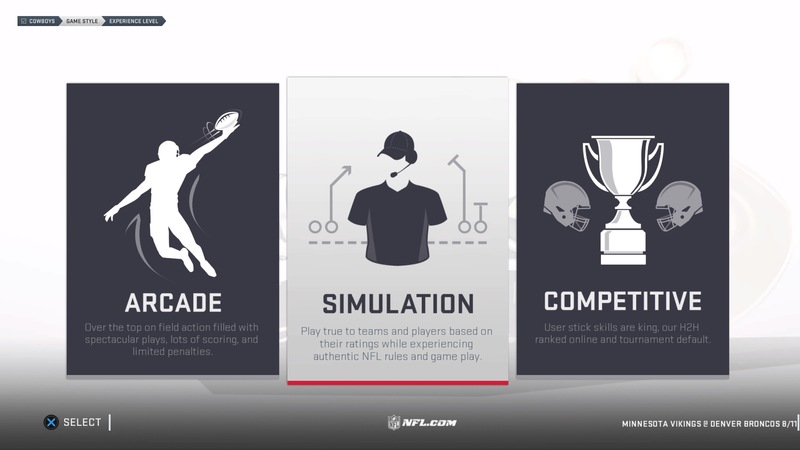 Upgradeable players, such as our Team Captain Jerry Rice, require training points in order to make them as great as possible. 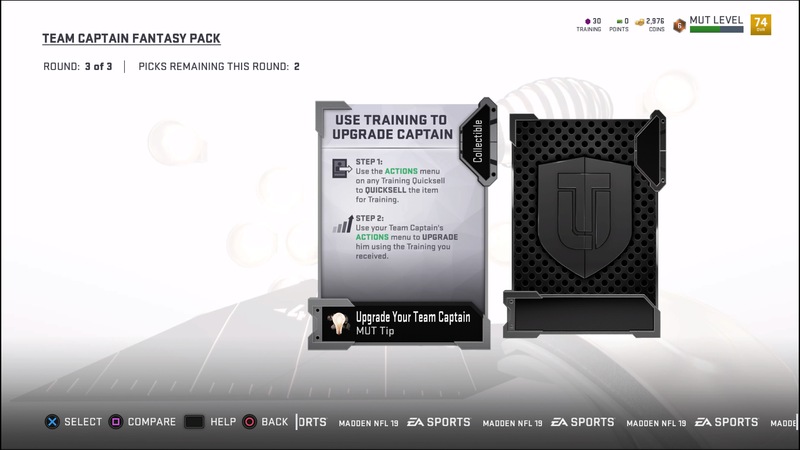 Not all players are upgradeable and it will say Power Up on the front of the card if it is upgradeable. 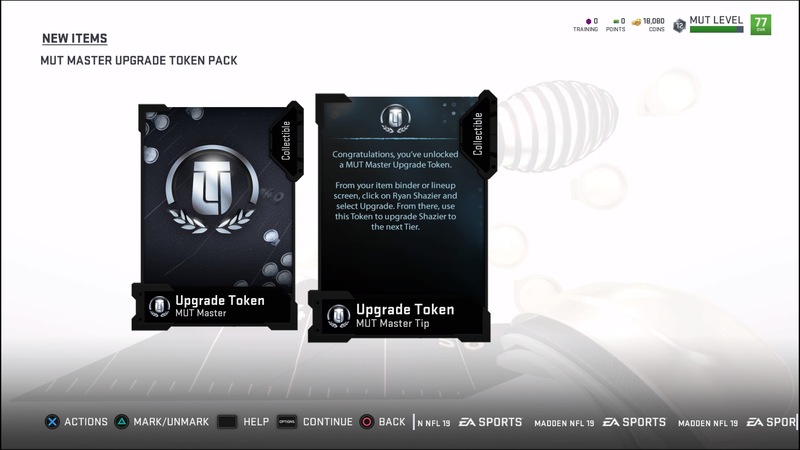 Keep this in mind if you are looking at auctions and see a low rated card of a player that you know should be rated higher than he is. 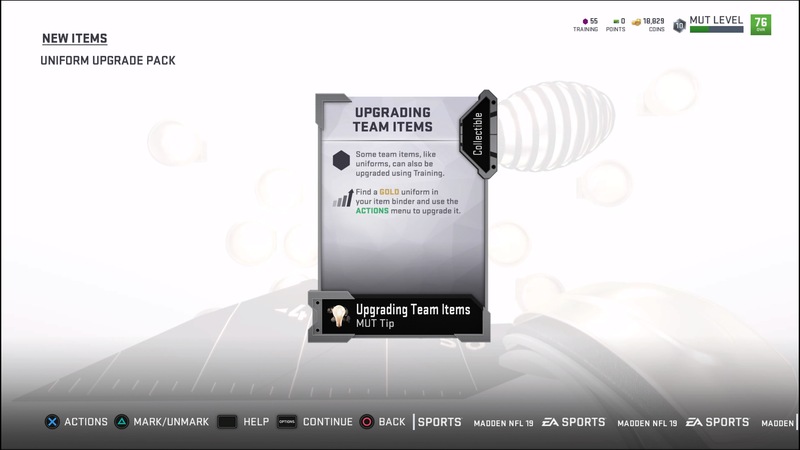 We picked up a 68 C Travis Frederick for next to nothing that we were able to power up to 83 within minutes of acquiring him, and that’s not even his max stat. 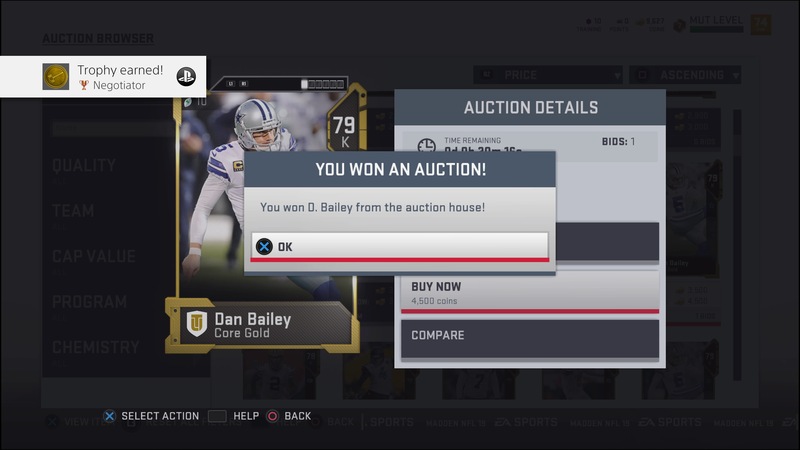 Keep that in mind as you look through the many auctions online. 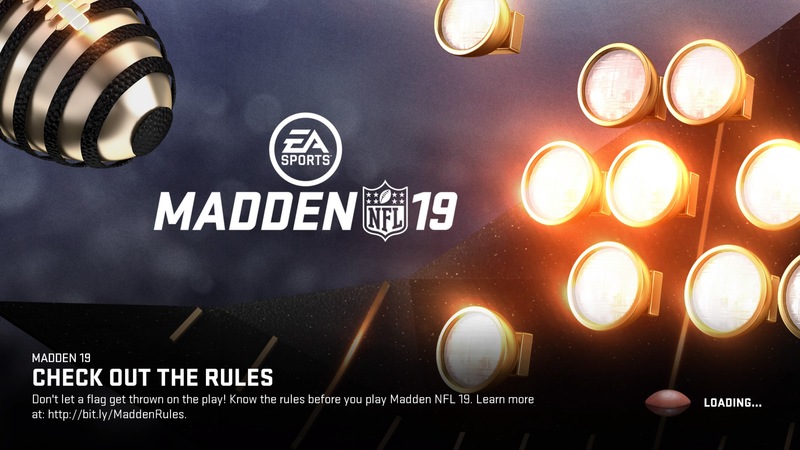 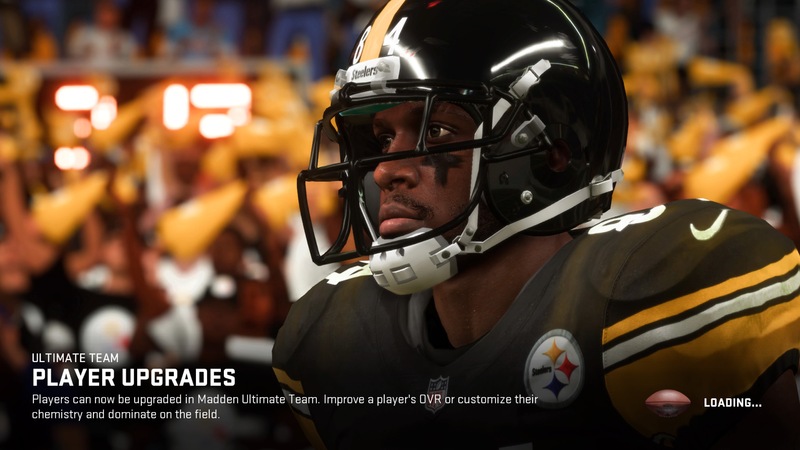 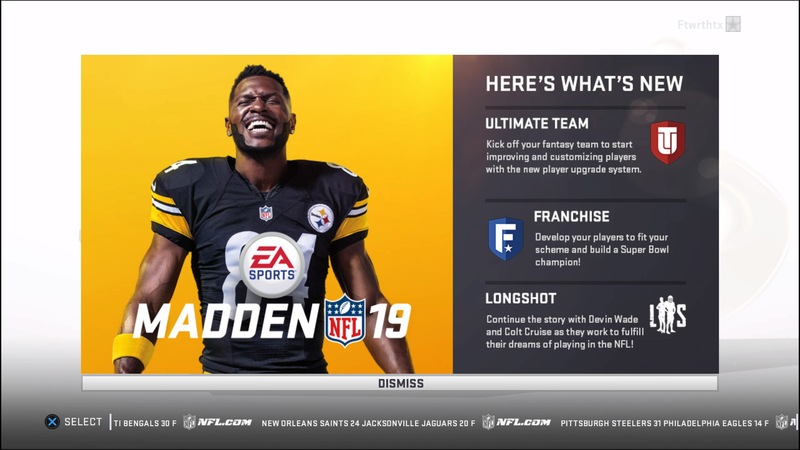 EA Sports tries every season to expand and improve on their flagship title and Madden NFL 19 continues that trend. 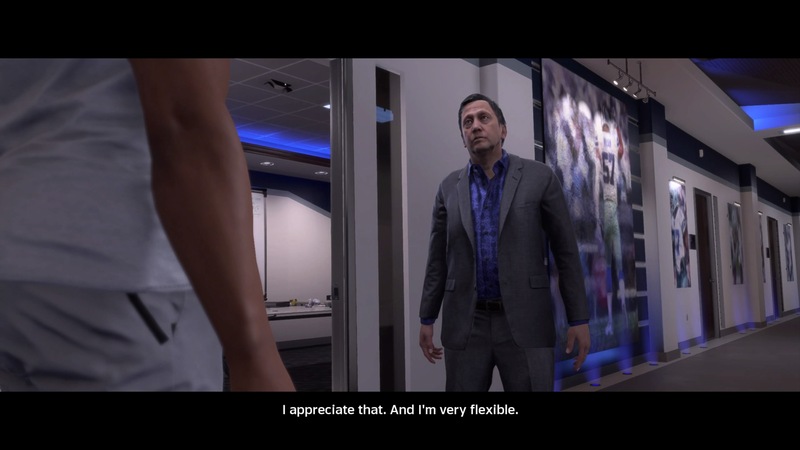 The animations are lifelike, the teamwork is impeccable, the graphics are incredible, and the gameplay is the best yet. 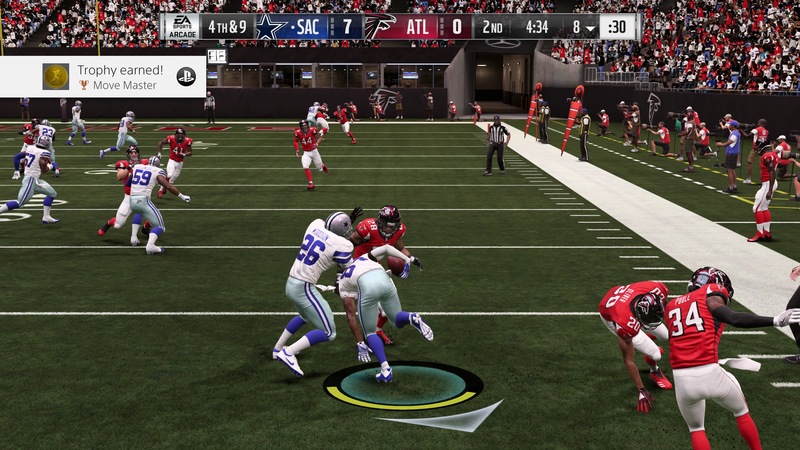 Madden NFL 19 review code provided by publisher and reviewed on a PS4 Pro. 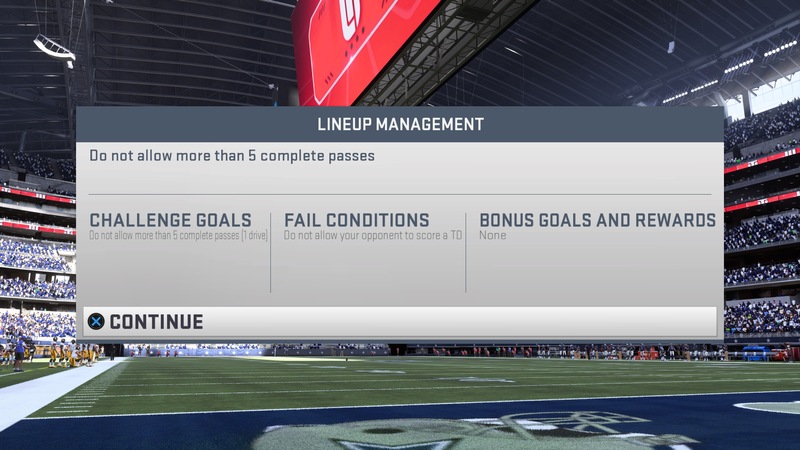 For more information on scoring, please read: What our review scores really mean.